WILMINGTON, Del. 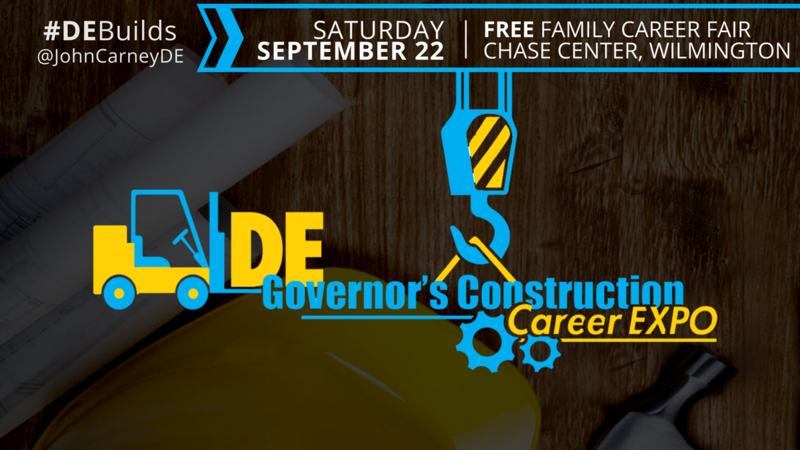 – On Friday and Saturday at the Chase Center on the Riverfront, Governor John Carney and a dozen partner organizations will host the first Governor’s Construction Career Expo to expose Delaware students and Delawareans exploring a career change to careers in construction. The construction industry is one of Delaware’s fastest-growing employment sectors with more than 3,500 job openings expected through 2024. The Governor’s Construction Career Expo will introduce training and career paths to students and those looking to move from jobs to meaningful careers. The Governor’s initiative is also an opportunity to connect employers and career-seekers, and to continue to train and develop a strong, skilled Delaware workforce. On Friday, September 21, from 9 a.m. to 2 p.m. at the Chase Center in Wilmington, middle school students from various schools in New Castle County will have the opportunity to participate in one of three scheduled blocks to meet with employers, sample fun activities and tools, and participate in heavy equipment demonstrations and virtual simulators. This specialized field trip was coordinated with school principals and school districts. All students, families, and members of the public, are invited to attend the Construction Career Expo on Saturday, September 22 from 10 a.m. to 2 p.m., at the Chase Center in Wilmington. The free family-oriented career fair will include activities for both youth and adults, skills training opportunities, on-site job interviews, heavy equipment demonstrations, and food trucks. Representatives from more than 50 local companies will be on hand Saturday to help Delawareans learn about high-wage jobs, and discover skills training opportunities. “We are excited to showcase the different construction trades and the growing opportunities for careers in Union construction,” said James Maravelias, President of the Delaware Building and Construction Trades Council. “I feel most fortunate to have worked with a group of such collaborative professionals from both the private and public sectors whose focus was only to plan and execute a valuable educational and informative event for Delaware’s students and the community,” said Victoria C. Gehrt, Ed.D., Superintendent of New Castle County Vo-Tech School District. Visit de.gov/build to learn more about the expo and join the conversation online using the hashtag #DEBuilds.